The world is consistent of various continents, each contained with numerous countries, many gifted with long coastlines expanding in beautiful oceans and bays. The islands are true natural wonders with rich sahara desert animals and bird life, and the rain forests so green. With all this, the world seems to have bathed in the sparkling waters of serenity. But there are some greased parts of the world, where water is not supposed to be even dreamt of – the deserts. The general idea among common people regarding deserts is the sandy, hottest, driest and most unfavorable areas of the earth. Plants could survive here only by God’s grace, but not humans. But, keeping these curses on deserts aside, we can view a trip to any of these sand-stores as a truly inspiring and life altering experience. A desert, at night, with a vast black shawl embedded with stars, covering its sand-particulate grounds, is one scene from the fantasy dreams. As well as the scenic view, the deserts provide testimonials of long-lost civilizations that, we may not know, even existed. A desert does not always mean sand. Some deserts receive, as little though, 25 cm of rain annually or on an average. Hardly 15% of the world’s entire deserted area does justice to its name, having pure sand. The largest of this area is covered by the Sahara Deserts and the Arabian Desert. Deserts are known for their extreme climates – baking sun during the day and graving cold at the night. The Sahara Deserts is the largest sand desert in the world (Antarctica is the largest ice-desert). It takes a huge part of North Africa. The north of the Sahara has the Atlas range of mountains in its lap. The total area covered by this desert is about 8.6 million square kms – that nearly comes out to be entire North Africa. The temperature of this vast region ranges from the extremities of 136°C during day and it drops below freezing point during the night. But despite these conditions, some parts of the desert are accessible and the region is well benefiting the tourist industry. The re-sculpting of the sandy face of the Sahara deserts takes place daily, and a great contribution is from the air currents and sand-storms and because the desert is a part of the trade wind belt. The desert’s pristine nature is judged by the way it eases unusual discoveries regularly. A meteor crater, 19-mile wide, had been discovered in Egypt in 2006. There was melting of sand caused by the heating effect of the meteor on the surroundings. The pieces of lime green glass, formed this way, can be found among the dunes. Dry river valleys, steep gorges and caves filled with carvings – these landscapes give rise to rock formations that are twisted in nature. The carvings and paintings in the caves seem to be of the time before the formation of the The Sahara Deserts. There’s a painting named Cave of the Swimmers that testifies the presence of water that the desert bore in its extremely initial times. The legends say that the desert had consumed cities and armies and various explorers who came to know its story. The story of the King of Persia, Cambyses, and his army is a good example. 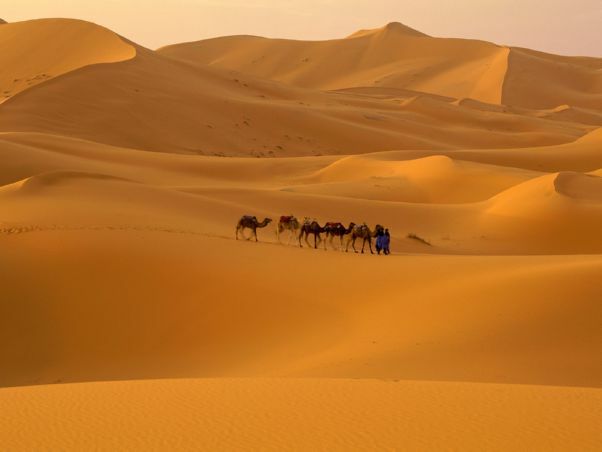 It is said that an army of ten thousand men had vanished in the folds of the Sahara Deserts about 2500 years ago. The remains of these lost kingdoms are still being excavated. Walking across a desert is truly a unique and a powerfully emotional experience. A number of holiday operators fix excellent desert tours for you – a once-in-a-lifetime trip, best done on foot during day and with camps at night. There is so much more to the great Sahara than sheets and sheets of sand. Mystery and secrets are sure to be buried in these sands of time. Can imagine myself going on camel back amidst these sand dunes.cheers!